More Infinite Shine newness from OPI? Yup. It seems they're really into giving us new collections this year. I like it! When is new polish a bad thing though? For Summer 2016, Infinite Shine is all about nuances of neutral with a limited edition collection of "makeup" shades inspired by the blush, beige, pink, and peach tones seen in the summer collections of Fendi, Elie Saab, Calvin Klein and Oscar de la Renta. Pretty hues and a long-lasting gel effect polish? Yes, please! 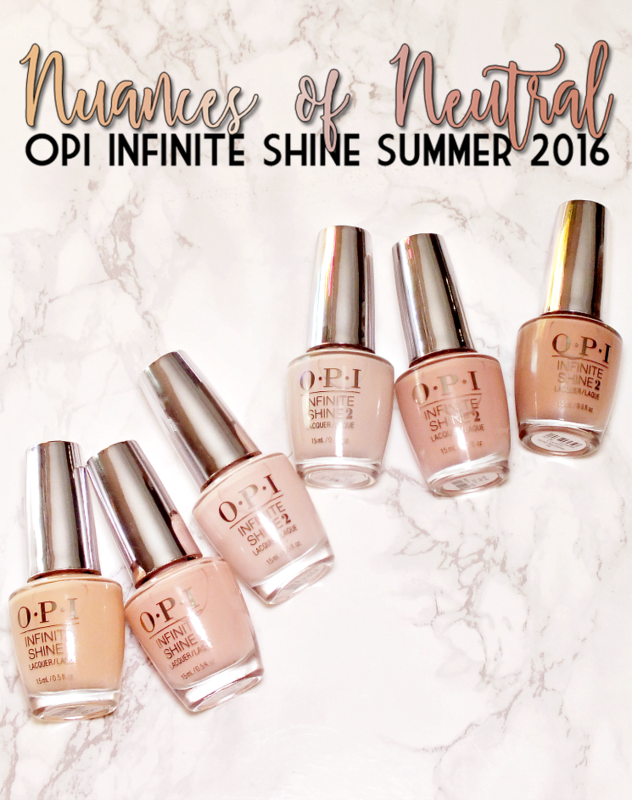 If you're new to the Infinite shine system, check out my full rundown and wear test here, and read on for swatches of the OPI Infinite Shine Summer 2016 Collection! Can't Stop Myself is a peachy cream shade. I find the Infinite Shine shades can be a bit tricky to apply at times, and this formula was one that needs to be babied. The polish is a bit thick and easily disturbed by the brush. A light hand is needed to avoid patchiness and bald spots. It self levels though and only needs two coats if you take your time an apply carefully. 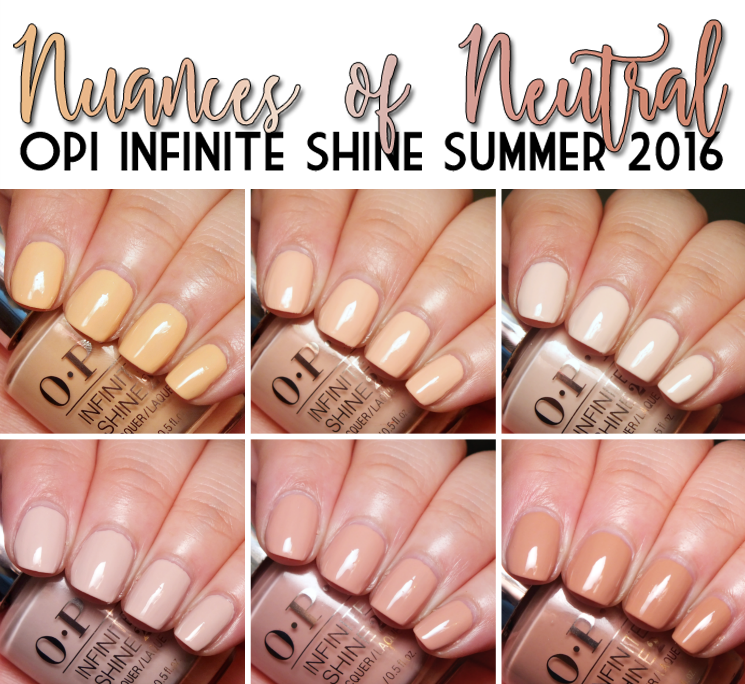 OPI Infinite Shine Summer 2016 Don't Ever Stop! Don't Ever Stop! is a salmon-blush cream. The formula is a bit on the thick side, but otherwise pretty easy to maneuver. The coverage is amazing, as one was incredibly opaque and not overly patchy. Two coats still required though. Staying Neutral on This One is a whitened, pale pink. Like many whitened, pale shades, there was some patchiness, but it evened out nicely in just two coats and is fully opaque. No Strings Attached is a mauve-kissed blush cream. The formula is thinner, and as such really easy to apply in two coats. Hurry Up & Wait is a pink-tinged tan cream. It has the same thinner texture as No Strings Attached and is just plain easy to apply. Two coats. No Stopping Zone is a light cocoa brown cream. Another easy, two coats and done formula. I had reservations about this collections at first- they all look very similar in the bottles- but I have really come to like these shades. I can't see many wanting the whole collection, as there are many similar shades in existence. These are really pretty shades to have if you're limited to neutrals for work etc. I'm really liking No Strings Attached, Don't Ever Stop!, and Hurry Up & Wait. What do you think? Are you a fan of any of these shades?